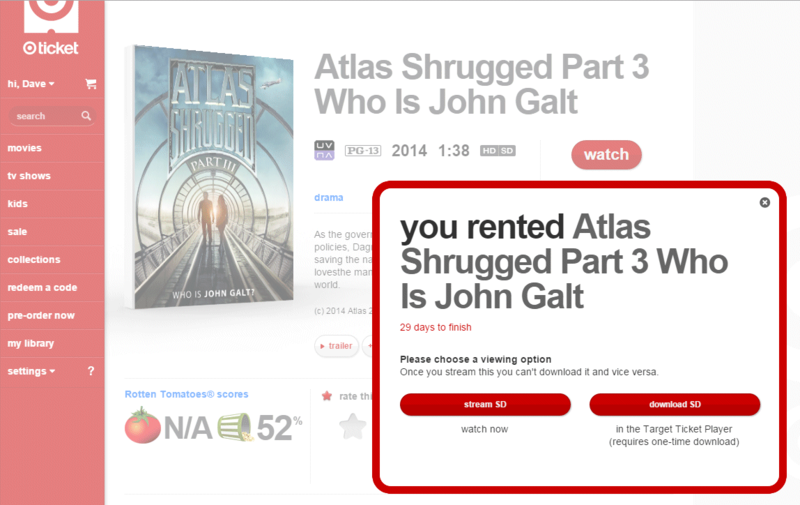 Target’s streaming service baits and switches? 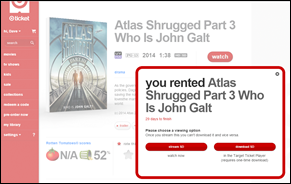 This evening I rented Atlas Shrugged Part III in HD ($5.99) from Target’s streaming service, “TargetTicket.com”. When I tried to watch it, the only option I got was SD. So… what’s the deal Target? 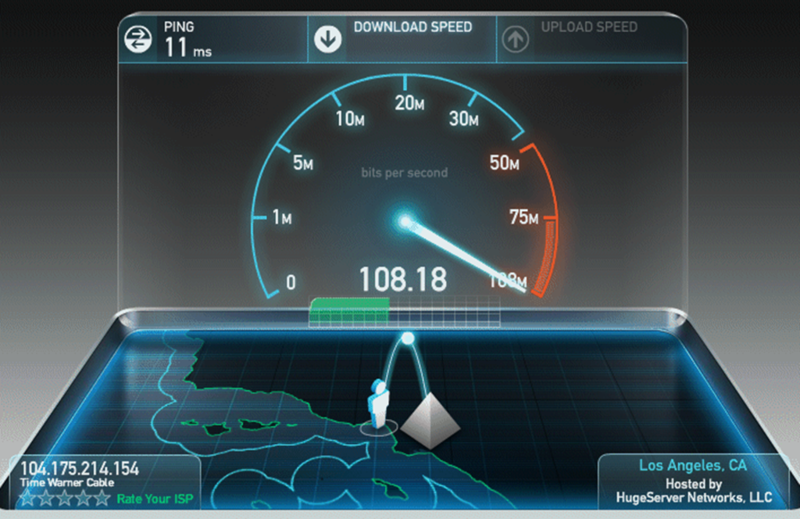 And you can’t give the excuse of ‘oh your download speeds weren’t fast enough’, because the speed test I ran before starting the video shows 108Mbps. FAR more than is needed to stream HD on Netflix even. I submitted a trouble ticket to Target Ticket. Their answer? ‘Oh, HD isn’t available when watching ON YOUR COMPUTER.” WHAT?! 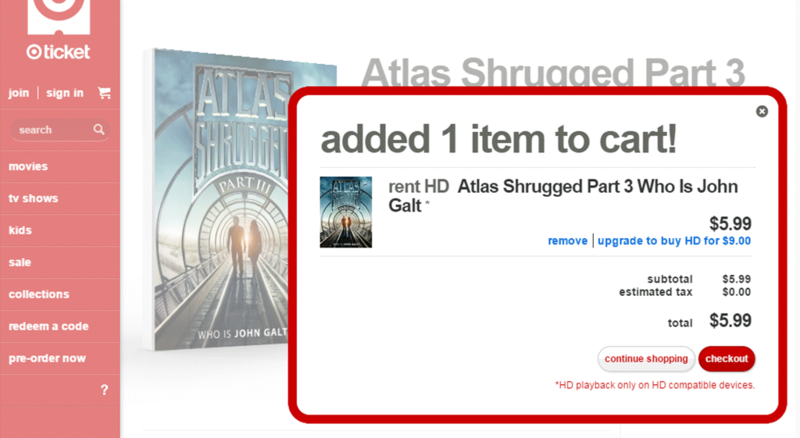 The FIRST place I would expect HD video playback to work – IS MY COMPUTER! YouTube has supported HD since late 2008! Read my very simple ticket and their laughable reply below. I rented Atlas Shrugged Part III in HD, but only SD is available when I try to watch it. Thanks for contacting Target Ticket Guest Support. 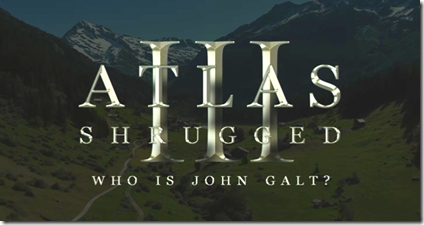 I’m sorry to hear that you’re only getting the option to play "Atlas Shrugged Part 3 Who Is John Galt" in SD. I’d like you to know that even though this title was purchased in HD, it may playback in SD based on the device you’re using. 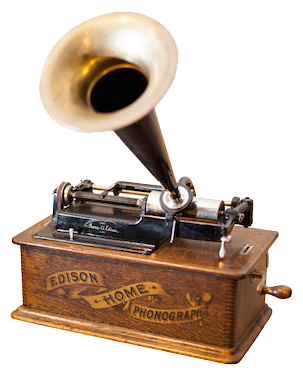 At this time, HD playback isn’t available on PC, iOS or Android devices. I’m sorry for any trouble this may cause. Please keep in mind; when playing a HD title on a PC, iOS or Android device, it will automatically be converted to SD. However, you can still enjoy your title in HD quality on devices like Roku, Xbox 360, Smart TVs and BluRay players. We’re always working to make Target Ticket your preferred destination to view your favorite movies and TV shows.